Prohibition was a dark time for America. Booze was banned, and crime was skyrocketing. But that doesn’t mean people stopped coming up with new ways to have fun with alcohol. A few months ago, I got my hands on Lost Recipes of Prohibition, a fascinating book by Matthew Rowley about a found object. The object in question was a bootlegger’s manual, cleverly disguised as crappy poetry book. Rowley had obtained the 20's era document from a friend, and after careful research, discovered that it was actually a brilliantly preserved journal written by a doctor named Victor A. Lyon. During Prohibition, it was still possible to obtain some spirits for medicinal use, and Lyon had concocted a number of ways to use chemistry and ingenuity to craft the most loved spirits of the time. In deciphering Lyon’s period script and combining it with his own knowledge of booze, Rowley does a brilliant job of explaining everything from how to make your own whiskey to methods for hacking readily available liquor to create delicious cocktails during the dark ages of mixology. I can’t recommend the book more highly. Reading the history of bootlegging and dubious pharmacological workarounds, I decided to try my hand at creating a Prohibition-era cocktail of my own: a spiked caramel lemonade. My efforts were met with mixed success, as I’m sure everybody’s was back in 20s. It was tough to find the ingredients that these cocktail hacker’s manual called for, and I’m also generally new to making stuff some scratch. All that said, when I took a sip of my finished Prohibition-era cocktail, it was divine. The flavors were fresh, if a little unfamiliar, and the labor required to improvise in a pinch paid off. Here’s how I did it. Rowley’s recipe for caramel lemonade borrowed from a century-old technique for turning cheap moonshine into passable aged whiskey. This involves adding some caramel syrup to fill out the flavor of often caustic moonshine—also known as white whiskey—and drenching the spirits in fresh squeezed lemonade. Right out of the gates, I failed. It’s hard to find moonshine in New York City, and the last jar that I brought back from my home state of Tennessee ran dry weeks ago. Since Rowley’s recipe called for Death’s Door White Whiskey, I chatted with my local liquor store worker who recommended a bottle of Death’s Door’s Vodka. If moonshine is corn whiskey stripped of its frills, vodka ought to do just fine. Then came the process of making caramel syrup. I’d never done this before and must admit that it’s easier than I expected. You just stir a mound of white sugar in a pot until it’s brown, add water, and whisk until the caramelized sugar is dissolved. I poured the the syrup into a glass bowl and let it cool off in the fridge, while I made the lemonade. Making fresh lemonade is a brave thing to do, especially if you don’t own a juicer. I squeezed the juice of six fresh lemons with my bare hands—a dumb thing to do—and then mixed it with some simple syrup and water. The rest is easy. You just mix the fresh lemonade with the booze. I started with the vodka and added the caramel syrup to taste. To top it off, I tore apart some fresh mint and stirred it all together in a jar which seemed appropriate. Pour it over ice and you’re done. Top it off with a garnish of fresh mint, if that’s your thing. Of course, you can ignore my history-obsessed methods of making ingredients from scratch as if you were doing this all behind the bar of a speakeasy. High quality lemonade and caramel syrup are readily available, though I insist you use fresh mint. Try this cocktail with vodka or moonshine or bourbon, and I’m positive you’ll like it. If you’re feeling really inventive, you could also take it to the next level, and read Lost Recipes of Prohibition to learn how to make booze from scratch. Me, I’m always happy making fresh cocktails from home. The artisanal douche bag bar down the street sells a drink that’s similar to this caramel mint lemonade for about $14. But in my opinion, you can’t put a price on crafting drinks for yourself. This is a slight variation on the Caramel Lemonade recipe in Matthew Rowley’s book. To make the caramel syrup, throw two cups of sugar into a good-sized pot. Stir until it turns anywhere from amber to dark brown. A darker sugar will produce a more potent flavor. Carefully add a cup and a half of water. The sugar will seize up like a wet brulee, but just keep stirring until everything dissolves. Stir in some salt if you want a salty caramel effect. Let cool. To make the lemonade, squeeze the lemons through a sieve to keep the seeds out of the juice. Add an equal amount of water and some simple syrup to taste. Once the ingredients are ready, add two ounces of the vodka to four ounces of lemonade. Splash in the caramel syrup to taste and stir with a couple pinches of freshly torn mint leaves. 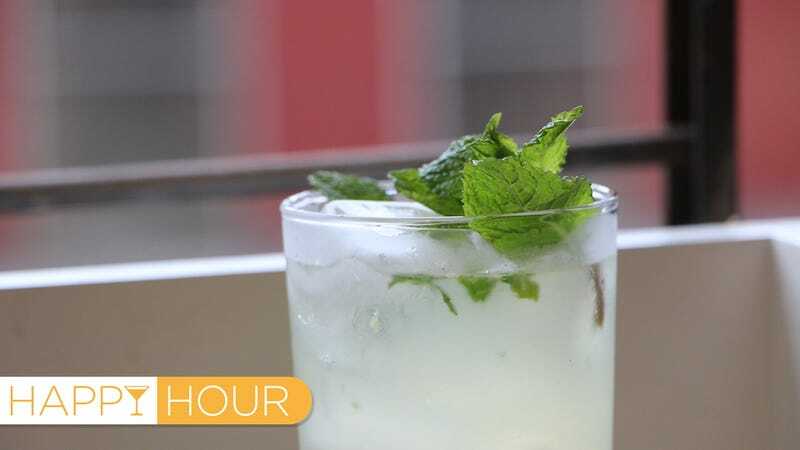 Add more mint to garnish and drink with a straw.